Diego De La Hoya (20-0, 9 KOs) of Mexicali, Mexico hosted a media workout today at Wild Card Boxing Club ahead of the June 8 edition of Golden Boy Boxing on ESPN at Turning Stone Resort Casino in Verona, N.Y. De La Hoya will defend his NABF and NABO Super Bantamweight Titles against Jose “Sugar” Salgado (35-4-2, 28 KOs) of Cozumel, Mexico in the 10-round main event. 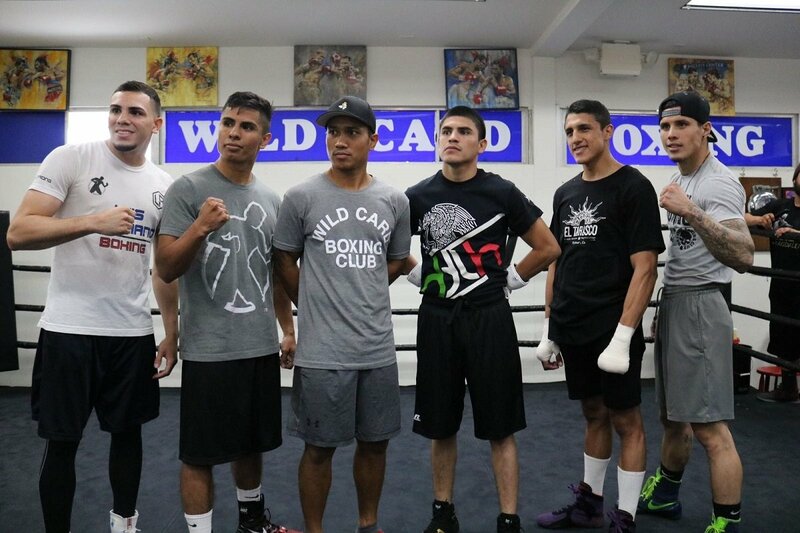 Fighters from the June 14 edition of Golden Boy Boxing on ESPN also participated in the workout. Mercito “No Mercy” Gesta (31-2-2, 17 KOs) of Cebu, Philippines will battle Roberto “Tito” Manzanarez (35-1, 28 KOs) of Phoenix, Arizona for the NABO Lightweight Title in the 10-round main event from Fantasy Springs Resort Casino from Indio, Calif.
ESPN3 will live stream beginning at 7:00 p.m. ET/4:00 p.m. PT. ESPN will air fights beginning at 8:30 p.m. ET/5:30 p.m. PT. ESPN Deportes will air the fights on Friday, June 15 at 9:00 p.m. ET/ 6:00 p.m. PT. The co-main event will feature an exciting battle between two undefeated Golden Boy Promotions prospects Manny “Chato” Robles III (15-0, 7 KOs) takes on Edgar “Kid Neza” Valerio (13-0, 8 KOs) for the vacant NABF Featherweight Title. The undercard of this event will feature prospects from around the nation. Herbert “Ace” Acevedo (14-2, 6 KOs), a native of Garden City, Kansas, will take on David Thomas (6-2-1, 2 KOs) in a six-round super lightweight battle. Luis Feliciano (6-0, 3 KOs) of Utuado, Puerto Rico will participate in an eight-round 140-pound bout against against Daniel Montoya (11-6, 8 KOs) of Tamaulipas, Mexico. Photos and videos are available to download by clicking here or copying and pasting link: http://bit.ly/DLHSalgado into a browser. Credit must be given to Golden Boy Promotions for photos and videos used. “THE OFFICIAL BEER OF BOXING” and Hennessy, “Never Stop, Never Settle.” The fights will take place on Thursday, June 14, 2018 at Fantasy Springs Resort Casino. ESPN will air the fights beginning at 8:30 p.m. ET/5:30 p.m. PT, and stream live on ESPN3 starting at 7:00 p.m. ET/4:00 p.m. PT. ESPN Deportes will air the fights on Friday, June 15 at 9:00 p.m. ET/ 6:00 p.m. PT.